Throughout film history, costume jewelry has been used to complete a character’s look. The pieces of jewelry we remember most from cinema are opulent, over-the-top pieces that would make any starlet swoon. Additionally, jewelry often plays a symbolic role in films, like in Titanic. Now, we’re looking to the movies for jewelry inspiration. Grab some popcorn and enjoy our top 10 most iconic pieces of jewelry from the movies (in no order). Scarlett O’Hara’s assortment of fine jewelry including her brooch and emerald earrings launched high fashion in Hollywood during the 1940s. The brooch features a figure riding a bird and belonged to the costume designer’s mother. O’Hara’s style of large signature jewelry pieces launched a new era in fashion as more women began to branch out and wear their heritage pieces. In this picture, Marilyn is wearing the infamous 24.04 carat Moon of Baroda diamond as the centerpiece of a lavish necklace. Centuries before dazzling on Marilyn, the pear-shaped yellow canary diamond adorned the neck of Empress Maria Theresa of Austria, and was even worn by Marie Antoinette. In its current form, the Moon of Baroda diamond is a simple, yet absolutely pear-shaped diamond that has found its home in a private collection. “I’m just CRAZY about Tiffany’s!” said Holly Golightly in Breakfast at Tiffany’s. Audrey Hepburn’s iconic diamond and pearl necklace with her signature Givenchy little black dress at the opening of the movie launched a new wave of style that defined Hollywood in the early 1960s and is still emulated today. Holly wore Tiffany & Co. strands of pearls adorning her neck and a matching diamond hair ornament. Who can forget the moment when Richard Gere pulls out the black necklace box, opens it and then scares Julia by slamming it shut? Julia Roberts’ necklace was custom designed for the film by French jeweler Fred Joaillier and is worth an estimated $1.35 million. The necklace boasts 23 wonderful pear-cut rubies in the center of diamond hearts. Wowza! Kate Winslet’s blue diamond necklace known as “The Heart of the Ocean.” In the film, the diamond was said to have originally belonged to King Louis XVI, and it was later shaped into a heart after the French Revolution. This one of a kind multi-million dollar necklace is dropped back into the ocean at the end of the film by Rose, symbolizing her passion for life and love over money. Cameron Diaz’s channel-set diamond engagement ring in My Best Friend’s Wedding is still just as timeless 30 years later. Julia Roberts (Jules) wanted the ring (and the man). Diaz’s character gets him in the end, wearing what would become the most popular style of engagement ring of the late 90s. Kate Hudson’s stunning yellow diamond Isadora necklace was designed for her to wear in this movie and is worth about 5 million dollars. It is the most expensive piece of jewelry ever created for a movie. In the movie, Kate’s character “frosted herself” with an assortment of fancy colored diamonds in the climatic ending of this romantic comedy. 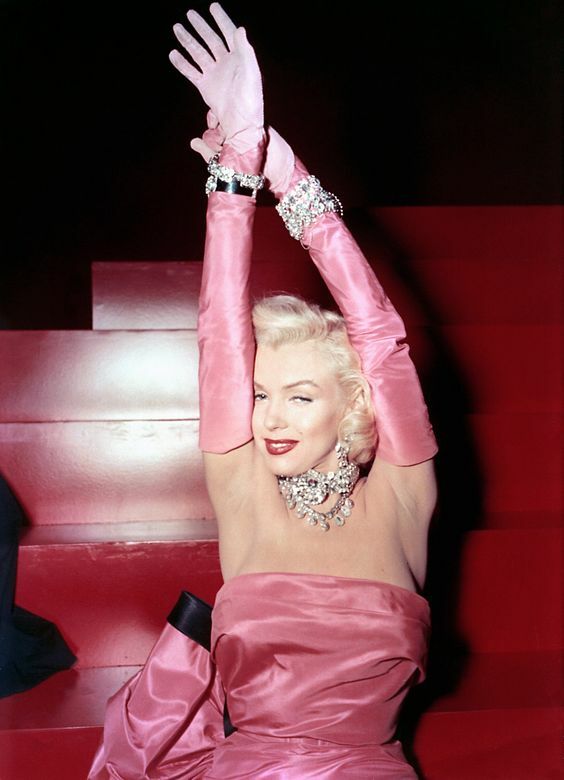 In addition to the 84 carat Isadora necklace, an estimated $14 million worth of jewelry was lent for the film. Blue Jasmine features Kate Blanchet’s wealth by flaunting her in Louis Vuitton, Chanel, Hermes and many other luxury items, but of course, we noticed her jewelry. Kate Blanchet’s gorgeous emerald diamond engagement ring and diamond pendants define the wealth she had. In an unexpected turn, (spoiler alert) her husband is jailed for embezzlement and the movie shows her without her large gems. Nicole Kidman’s signature diamond necklace, made of 1,308 diamonds, was designed by Australian jeweler Stefano Cantur. As Satine’s suitor puts this elaborate diamond necklace around her neck, she remembers her Marilyn Monroe-esque musical scene but soon realizes that this necklace keeps her in a life without passion. Carrie Bradshaw’s (Sarah Jessica Parker) black diamond ring ushered in a new wave for black diamonds and non-traditional engagement rings. In the film, when Mr. Big finally gives Carrie a 5-carat black diamond engagement ring, Carrie asks, “Why black?” to which Mr. Big responds, “Because you are not like anyone else.” Set in 18k white gold and 80 pave diamonds, jewelry designer Itay Malkin worked with Sarah Jessica Parker and Patricia Field to create the ring.